I'm sitting in the back of the room. After I got here, I uploaded the photo I took of the group dinner last night, and then two shots of the room. What's really cool is that Lichen (who is sitting half way around the room) already beat me to blogging it! When I logged in the Darien wireless network, there were already nine other users. It's official! There is now an a photo directory of the members of ALA Council. Technically it is a "photo gallery" since I think that "facebook" is a trademark of someone. Leslie Burger took the lead last spring to start this. She enlisted me along with Rochelle Hartman and now former Councilor Jessamyn West to work with wonderful ALA staff members Lois Ann Gregory-Wood and Liz Dreazen to pull this off. If you are a Councilor and read this, and your photo is not there yet....send one to Lois Ann! Please! Well, it is not only the beginning of Banned Books Week, but it is my birthday. It is not a major milestone this year. Since last year, I have found that I have a colleague and friend who not only shares my exact birthday, but was born in the same hospital, and with the very same obstetrician! More amazing is the fact that it is not where we currently live! It is kind of cool to have that "brothers seperated at birth" thing going on! We joke about it constantly. Did I mention that he is the deacon at my church where I am a Lector and Special Minister of the Eucharist? About a month ago, we found that one of the altar servers was born on our 40th birthday. This particular young man is also in the Boy Scout Troop where I am one of the Assistant Scoutmasters. I find it reassuring to find compatriots, and sharing a birthday is a special connection. On a more sombre note, I did some math recently. On April 1, 2007, I will be exactly five years older than my father was when he died. We all have different relationships with our parents. I am blessed that my mother, at 81, is in reasonably good health. There are times, and recently they seem more frequent, when I really miss my father. He died when I was 21. I really did not have a chance to develop an adult relationship with him. But at the same time, I miss him. One of my friends was talking about the fact that her father died when she was in her mid-twenties, and that she never knew her grandparents very well. She also only has one sister. My life has been similar, but also opposite. My father died six weeks after I graduated from college and was not yet 22. I have seven younger brothers and sisters. My youngest sister was nine (9) when our father died. At the same time, all of my four grandparents were alive for my wedding, and three of the four met my eldest son, their great-grandson. One of my grandparents was alive to see all three of my children born, and when my beloved Grandpa Fitzgerald died he had over a dozen great-grandchildren. His eldest great-grandson was an altar server at his funeral. I've been paying more attention t my health recently, and it occurred to me, that at this point I am more active than my father was. My father faced some of the same weight issues I have been wrestling with. I remember some vague discussion of that in my distant past. But up until his final fight with cancer, he was out there wrestling with us boys (I have three younger brothers) and throwing around the football and baseball. Those have never been skills of mine. However, I can swim a half-mile in 30 minutes, and can ride (on a bike) 20 or so miles in an hour. Two summers ago, prior to my current fitness craze of mine, I managed to keep up with six teen-aged boys and canoe over 70 miles in a week. Eight or so years ago, I swam a mile, straight, in open water. At the same time, while working to keep myself in better shape than my father, and visiting the dermatologist regularly, I still miss my Dad. Diet update: I've been hanging around 200 pounds for about the last week. That is not bad since I have taken up adding some drinks to my life again ... for good or ill.
A birthday is a good time to sit back and assess. My physical health is better than it has been in many years. My blood pressure medication has been reduced for the first time in 30 years of taking it. My cholesterol numbers are great. My blood sugar is below the threshold for diabetes (which runs in my father's family), and my PSA numbers are normal. My mother and I both look good, and we feel good. Monday brings the Library Boot Camp East. I'm looking forward to it. Jessamyn West will be spending Sunday night at my house (and I am glad to offer the hospiality). I expect it to be one of the best birthdays recenty. Certainly better than my birthday in 1989 which was spent at the calling hours for Grandpa Fitz. That was the last time I spent a birthday with my siblings. Enough blathering. More professional thoughts to follow. I'm going to be judicious in what I say here since some of my staff actually read this. First of all, I am reading Michael Stephens LTR on Web 2.0 which I received as a blogger. I admit that I am not far into it, and will do a later post on the whole issue of trust and radical trust. But that was the section I had just read before having a meeting with the Library web committee. After all, I'm not about to do a huge web site like the Library's. There are many staff who know so much more than I both about creating the site, as well as about the content. This time we were talking about Flickr and blogging. First the good news, there is now a group of us who are going to start the Library's official blogs which will be integrated into the next version of the web site. I firmly believe that you cannot "make someone do something." And that is particularly true with blogging. If you get someone who is enthusiastic, the job will be much better done than if the person doing it is reluctant. The more difficult was about Flickr. The Library has a Flickr account now, and yes, we sprung for a "pro" account so that we can have more than three sets. That is great, and the staff member who has taken hold of this is doing a great, and enthusiastic job. If you watch the site, don't be surprised to find that over the course of the next few months you see several thousand photos from the past four years added. We've had a digital camera that long, taken lots of pictures, and not been dealing with the collecting/archiving part very well. The other concern was about our pool. [Of course there was the whole discussion about "sets" versus "pools."] Most of the photos there are ones from my Flickr account. "Who can contribute?" "Who controls that?" "What if they have something inappropriate on their site?" 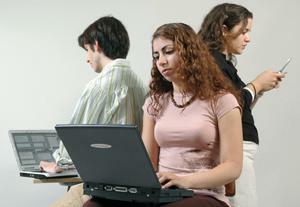 All those questions which involve trust and the social networking part of Web/Library 2.0 were brought up. I, as the administrator, and the one whose job is on the line, am willing to take a risk here. Why are others so risk averse? It costs us very little. Other libraries are doing it without problem, we are not first, and I'll be blasted if we will be last! In this profession it is really important to find a coach and/or mentor. I've been lucky to have several over the years, and I still even look for advice from others. When I am asked to help a Library School student, I try to help. One such request came this week from Jennifer Macaulay. I don't think I have ever met Jennifer, but she is a student at nearby Southern Connecticut State University, and I have been reading her blog for a bit. She asked me some questions about management, and then distilled my sometimes rambling answers for her assignment which she posted here. Thanks for asking Jennifer....and she did let me see what she wrote before she posted. She linked to me...so I have linked back to her. I want to thank Jenny Levine for calling this out. There is now a wiki which lists blogs by library administrators! It is part of the Blogging Libraries Wiki, and lists blogs written by library directors/administrators specifically from an administrative view. So visit the Library Director page. I looked at my blogroll on Bloglines and added Jim Rettig's Twilight Librarian and Christie B's Travels with the State Librarian. If you know of others, it is really easy to add them to the list! Five years ago, we were all in a state of disbelief and confusion after the attacks on the World Trade Center and the Pentagon, as well as the plane crash in that Pennsylvania field. I lost one of my professional colleagues, Margaret Orloske, who was a librarian in the World Trade Center.Let us start with a moment of silent reflection, each in our own tradition, to remember those who died that day. Dear Lord, we gather in safety each week to enjoy the friendship of Rotary as we try to make this world a better place for ourselves and those who will follow us. Bless this food and the hands who made it. Bless us as we try to do your work in Bridgeport and the world. 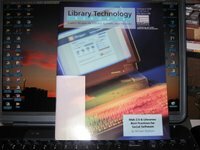 You could have knocked me over with a feather a week or so ago, when I got my copy of the new Michael Stephens authored issue of Library Technology Reports on Web 2.0 for Libraries. I have not read it yet, only glanced at it. Here it is as I was running a back-up tonight. Sunset photos (current desktop) will go to Flickr eventually. You can get your own copy from ALA. The front page, above the fold, left-hand column in today's Connecticut Post caught my attention. [If you get there today, September 3, the home page has the graphic from the story]. The title "Talk just isn't what it used to be" is certainly intriguing, and talks about a subject which has certainly attracted a lot of attention in library circles, communication style differences between generations of library users. I first really began pondering this issue when the ALA Executive Board [EB] heard a presentation at the 2004 Annual Conference in Orlando. Ria Newhouse and April Spivak presented to the EB some of the information they had gathered from their cohort of recent Library School graduates. Mary Ghikas [The Green Kangaroo] had heard them present at the PLA conference in Seattle in March of that year, and as the Senior Associate Executive Director of ALA, she brought them to us because the topic has huge implications for the Association and how it does its business. I've learned a lot since then. I have an AIM account (and use it periodically, often to talk with my kids), have been blogging for over a year now, have a Flickr account with a not inconsiderable number of photos and a growing list of contacts, and recently changed my phone service to be able to have text messaging at a much cheaper cost (because I was using it so much). As a matter of fact, today is the annual bringing stuff to college. My daughter is at Band practice, and we will meet her in Boston. Our specific instructions are to text her when we leave home so that she can be ready to meet us at her dorm when we arrive. We'll also call when we get off Storrow Drive. It is a tool. It is how we will communicate in this part of this century! All of this is to say, even for us "old folks" it is a matter of Change or Die. Last night I had an incredible opportunity. It was the opportunity to throw out the first pitch at the Bridgeport Bluefish baseball game. September 1 is the anniversary of Bridgeport's "Orator Jim" O'Rourke who is in the baseball Hall of Fame (Coopertown). It was also "Library Night" with staff from the Bridgeport Public Library and the neighboring Fairfield Public Library in attendance. I had the opportunity to throw out the first pitch. I took a bunch of pictures, and Jill even got a couple of me. There is something about a baseball game, even a minor league game, when you are there in person. The baseball field is just down the street from the main library facility. Our address is 925 Broad Street, while Harbor Yard is at 500 Broad Street. Whenever I go there, I park in my spot at the Library and walk under the highway. The Bluefish have helped to re-vitalize downtown Bridgeport. Over the past eight years or so, they have brough almost 750,000 people from all over the state into the City. I stayed through the end of the eleventh (yes, 11th) inning. Unfortunately the Bluefish lost in the 12th. They are still leading the Atlantic League's Northern Division for the second half of the season. If they win, they will enter a playoff, and, with any sort of luck, they will end up the winners. They are the winningest team in the eight year history of the Atlantic League. A New Car at my house -- and I did not have to pay!